On Sunday, March 6, Palm Beach County residents of all ages came together for a “Sunday Funday” filled with hula hooping, dancing, yoga, rock climbing and other family-friendly activities intended to get everyone active and moving. Seniors, kids and adults took to Palm Beach County’s West Boynton Park and Recreation Center from 10 a.m. to 2 p.m. as part of an initiative to offer inter-generational fitness activities to the West Boynton community. “In support of our department’s mission, we partnered with the Coalition of Boynton West Residential Associations [COBWRA] with the goal in mind of promoting health and wellness to people of all ages,” said Recreation Programs Supervisor Jackie Lambert. The Family Fitness FunDay was an intergenerational event that featured an expansive menu of indoor and outdoor activities for all ages. Participants experienced aerobics, karate, yoga, tai chi, zumba and other activities available for all ages. Outdoors, kids enjoyed a bike rodeo, played soccer, got their faces painted, and more! The activities were accessible for people of all ages and abilities. Other community partners, including the Palm Beach County Sheriff’s Office, Palm Beach County Fire Rescue, Palm Tran, Delray Medical, and Bethesda Hospital were present. “Community partners came together to provide opportunities for physical activity, socialization and provided information about wellness resources and services to assist in identifying and supporting the health, safety, and well-being of all residents,” explained Lambert. The Palm Beach County Sheriff’s Office conducted fingerprinting demonstrations and spoke to the public about safety issues. Palm Beach County Fire Rescue allowed children to draw on their fire trucks, simultaneously speaking to people of all ages about the parts of a fire truck and their duties as firefighters. “Anytime you put together an event that brings the community together and promotes health and wellness that offers different ways to get moving, it’s beneficial,” said Palm Beach County Mayor Mary Lou Berger, who was present at the event, along with Commissioners Shelley Vana and Steven Abrams. After giving an introduction speech to attendees, Berger took part in a zumba, hip hop and aerobic class. “It was a great workout,” said Berger. According to COBWRA representatives, this was the first time COBWRA put on an event of this magnitude for the West Boynton Community. “We wanted to reach a broader community,” explained Valerie Fuldauer, a COBWRA community member. She, along with COBWRA chair Joan Brunswick and Vice Chair Debbie Murphy, say they came to Palm Beach County Parks and Recreation with the idea, and staff helped guide them through the entire process. “They’ve been fabulous,” said Brunswick. COBWRA officials say they hope to plan more events like Sunday’s Family Fitness FunDay in the future. It’s not often we get a chance to turn down the lights and take in the beauty that the night sky has to offer. On Saturday, February 27, over 2,000 Palm Beach County residents, tourists, adults, kids, and nature lovers alike did just that – for free – at the fourth annual Dark Sky Festival. People of all ages visited Palm Beach County’s Okeeheelee Nature Center from 6-10 p.m. to escape the glowing lights we are so often bombarded by, to gaze at the stars, learn about animals, and enjoy the peacefulness of the dark while having fun with their friends, family, and loved ones. Campfire, animals, movies & more! darkness. Indoors, owls, snakes, lizards and turtles gave animal lovers a chance to learn about the animals that depend on the dark for survival. Curious kids took turns dissecting owl pellets, and visitors of all ages learned about owls and bats through presentations from passionate experts. Outdoors, active guests enjoyed guided nature hikes through the dark, while others gazed at stars and planets through telescopes. An outdoor classroom allowed guests to soak in the beauty of the night sky, while listening to campfire stories and eating s’mores. Benji Studt, the Environmental Program Supervisor with Palm Beach County’s Environmental Resources Management, taught a workshop that introduced participants to Palm Beach County’s natural areas and the photographic and recreational opportunities that lay right outside our front doors. “I introduced participants to some tools to improve their composition skills,” said Studt. The goal of the event was to teach visitors about the negative affects of light pollution and to encourage better practices with lighting. Guided night hikes, a campfire and s’mores, outdoor movies, photography workshops, bat and owl presentations, live wildlife exhibits, among other activities, helped guests appreciate the darkness. Light pollution is the “introduction of artificial light into the environment”. The event focused on the impacts of light pollution, and the benefits of having natural night skies. Excessive light pollution threatens humans and many animals, including sea turtles, owls, bats, and others that depend on the dark sky for survival. Excessive light pollution may also waste electricity and destroy the beauty of the night sky. Why should we “turn down the lights”? Various experts, photographers, and astronomers were on hand Saturday to explain the dangers of light pollution. Furthermore, Studt explained that migratory birds use the night sky as a roadmap to their seasonal destinations, and humans feel effects to their circadian rhythm as a result of light pollution. Check your home lights – is glare hiding potential intruders? Do your lights shine down, or out and up where energy is wasted? Turn off unnecessary lights – and use motion sensor switches for effective deterrence. Shield and lower lights, and use dark-sky friendly fixtures. Spread the word – tell businesses when you see that their lights are bad. 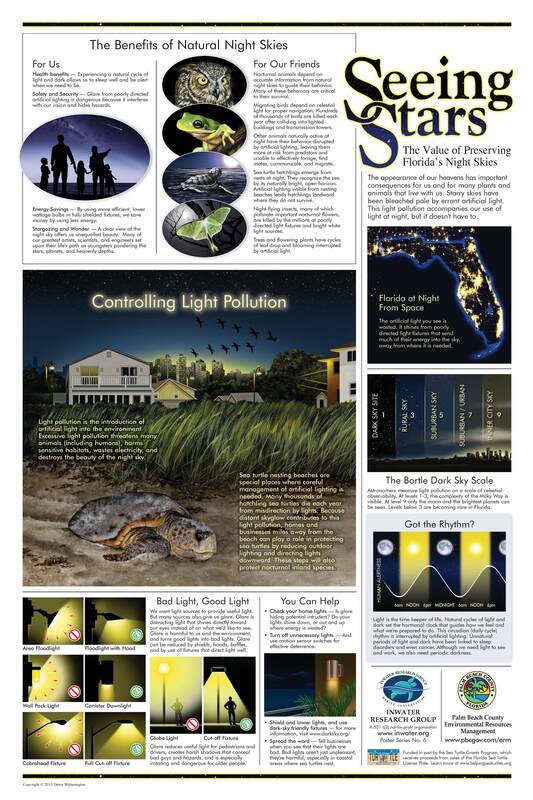 Bad lights aren’t just unpleasant, they’re harmful, especially in coastal areas where turtles nest. Each year, thousands of enthused visitors make their way to Okeeheelee Nature Center to gaze at the stars and learn about what they can do to make the night sky more visible for humans and animals the depend on it. “We had people from all ages and demographics, and the response is overwhelmingly positive…people were impressed with how unique the event was,” said Sharkey. This annual event is one of the largest dark sky events in the country; it was made possible through a partnership between the Palm Beach County Parks and Recreation Department, Environmental Resources Management Department, International Dark-Sky Association, among others. For more information on how you can help fix the problem of light pollution, please visit the International Dark-Sky Association, www.darksky.org.